May 2016 - Massimadi Bruxelles Festival des films LGBT d'Afrique et de ses diasporas. More information coming soon. 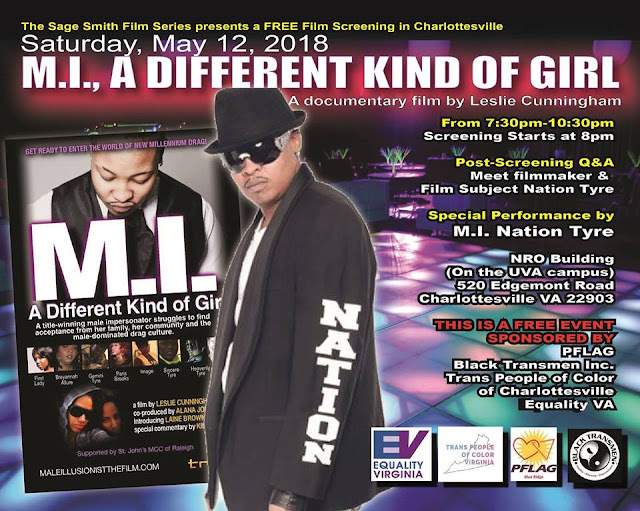 September 19, 2014 - As a part of the 2014 Gender Reel Film Festival, North Carolina Central University presents a special screening of M.I., A Different Kind of Girl. Michaux School of Education Auditorium,700 Cecil St., Durham, NC 27707. 8:15-10:00 - Social and Networking Event hosted by Campus Pride. September-October 2014 - Gender Reel Film Festival 2014 - Screenings in five major cities. Click here to learn more. July 16, 2014 - Reel Girl Film Fest- Special screening in order to help lesbian, bi-sexual and transgendered women undergoing treatment for cancer More details coming soon. June 2014 - Culture Unplugged - We Speak, Here international online film festival. Watch the special online Now! Watkins College of Art, Design & Film, Nashville, TN - Showing Sunday, October 21, 2012. FREE Screening. Visit http://www.nashvilleblackpride.org. October 11, 2012 - OUT ON FILM - Atlanta Gay & Lesbian Film Festival. Thursday, 3:30pm. Landmark Midtown Art Cinema, 931 Monroe Dr., Atlanta GA 30308. Cost TBA. September 19, 2012 - St. John's MCC Church, Wednesday, 6:30pm , 805 Glenwood Avenue Raleigh, NC 27605. FREE Screening. September 1, 2012 - IN THE LIFE ATLANTA BLACK PRIDE, Atlanta, GA, Melia Hotel, 4:00pm. $15 all day festival pass. August 10-12, 2012 - North Carolina Gay and Lesbian Film Festival 2012- Durham, NC - Showing Aug 10-12, Friday, Saturday and Sunday! Q&A with the filmmakers and cast! Post Screening Cocktail Reception: Friday, August 10, 2012 (9:00pm-11:00pm) - Join the M.I. cast and filmmakers for cocktails at the Marriott Hotel Main Bar, 201 Foster Street, Durham, NC directly after the 7:10pm film screening at the Carolina Theatre! PREMIER SHOWING - Midnight Movie Madness. Time TBA. © Copyright 2012-2013. TRIBES Entertainment. . Awesome Inc. theme. Powered by Blogger.